Assisting clients achieve their development and organizational goals is what motivates Hilary Fulp about her work at The Curtis Group. As a client manager, Hilary works with a diverse set of nonprofit clients throughout the Mid-Atlantic region to enhance their overall fundraising capacity. She has successfully overseen the day-to-day execution of numerous campaign planning studies, and her current campaign work ranges from $2 million to $16 million. Beyond her experience with major gift fundraising, Hilary has presented on topics, such as building a fundraising board and crafting a strategic development plan. Prior to joining The Curtis Group, Hilary served as a legislative manager at a federal advocacy and consulting firm in Washington, D.C. In this role, Hilary advanced the legislative agendas for a diverse set of nonprofit clients, which included foundations, major health systems, broad-based coalitions and grassroots campaigns. 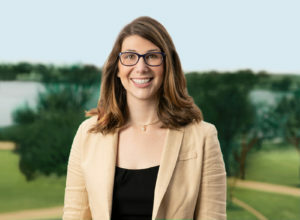 Before transitioning to the private sector, Hilary spent nearly two years as congressional staff for a senior appropriator in the U.S. House of Representatives. Hilary holds a Bachelor of Arts degree in political science from John Carroll University. She lives in Norfolk with husband, Jamie, and dog, Gideon. Outside the office, she enjoys volunteering and supporting charities focused on poverty alleviation, wellness, and animal welfare. Ready to start your success story with The Curtis Group?